When I got the call from Scarlett Syse, the Editor of the Daily Journal, I was in a state of shocked disbelief. That someone, let alone a newspaper editor, enjoyed reading about my food flops, motherly rants and occasional culinary coups was unbelievable. Now that this has become reality I feel like I have so many people to thank for supporting me in this endeavor. The first would be my wonderful husband, Matt. When I told him that I was going to turn all of my scribble filled notebooks into a blog he was like “what is a blog….it sounds strange”. He has supported me and held his tongue when I hold up dinner because I can’t get the right shot of the food or when I am still up at midnight pecking away at the keyboard. What started as an online journal for my family and I has turned into a neat little column. Even if this has a short run I will still treasure this forever. Next would be my great family. My kids actually want to read my posts. Jacob always goes over them with a fine tooth comb and Noah critiques my pictures. My parents and Sister have gone out of their way to send my link out to the ether so that others could check me out and I appreciate this. I have a wonderful friend who is a Kitchen Diva herself, Isabelle. You can find her at Isabelle at home on facebook or at http://www.isabelleathome.wordpress.com/ . 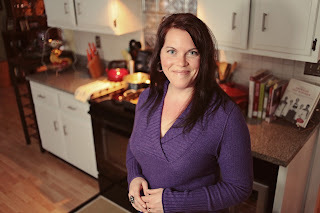 She is equal parts Martha, Jillian and Barefoot Contessa. I have never made one of her recipes that didn’t turn out perfectly and she is a daily source of inspiration for me. Whereas I am a mom that likes to cook she is a mom that likes to cook and should write a book! Her experiences in the kitchen as well as her vast culinary knowledge remind me why I look food and cooking. We share a mutual love of the “Woman Cave” and all things yummy. All of my extended family and friends have knocked my socks off with the compliments and words of encouragement. The ladies I work with are some of the best people I know and i couldn’t have done this without all of their encouragement. I can’t name you all as I don’t want to leave anyone out but yo know who you are ???? Lastly, I would like to thank Scarlett for giving me this opportunity, Ryan for writing the piece about me (it was great by the way) and Josh for taking those awesome pictures. I am not used to this kind of attention and really have never had my picture taken like this before. He was such a professional and we will definitely have him here again to do some family shots. You can find him at http://www.sunlitimages.com/ . So I hope you have enjoyed reading so far. Please feel free to give me your comments and suggestions. I can take it. Now I am going to head outside and enjoy this sunshine and time off with my family. Have a great weekend!